Jesus and his disciples climbed into a boat to cross over to the other side of the lake. Jesus lay down and fell asleep. While he was sleeping, a great storm came on the lake and the disciples were filled with fear. Water was coming into the boat and the disciples thought they were all going to drown. They woke Jesus up and cried out for him to save them. Jesus asked why they had so little faith and why they were so afraid. Then, Jesus stretched out his hand and rebuked the winds and the waves and the stormed stopped. The disciples were amazed that even the winds and the waves obeyed Jesus. 1. Explain to the children that we do not need to be afraid of things. Jesus tells us to cast all our cares onto him because he cares for us. 2. Give each child a pencil and some paper. Encourage the children to write down, or draw pictures of things that they are afraid of. 3. Give each child a chance to share one or more of the fears they wrote down. 4. Tell the children that we can give these fears to God and in doing so God will help us overcome our fears. Tell the children to put the papers into the sealed box. 5. Tell the children now that they have put these fears into the sealed box and given them to God, they can no longer take them back. When we try to take back our fears, we are saying that God is not big enough to help us with our fears. We have no faith. God wants us to have faith, not fear. We must believe that he will help us when we are afraid. We all have fears. God does not tell us that we should not have any fears. Instead, he says that the fears we do have we should cast upon him, because he cares for us. (1 Peter 5:7) We must have faith in Jesus that he is big enough and powerful enough to take care of all our fears. Jesus is the only one who can calm the storms in our lives. We must have faith! 1. Have the children make loose paper balls with the old newspaper. 2. Put 3 or 4 children inside the box. They will pretend to be the disciples. The rest of the children in the class with pretend to be the storm. 3. Place 10-12 paper balls in the boat with the ‘disciples’. When you say go, the ‘storm’ will take the remaining paper balls and try to fill the boat as fast as they can. The disciples in the boat will try to toss the paper balls out. Give the children two minutes to play. Encourage the ‘storm’ to make wind and rain sounds as they play. 4. Rotate the children in and out of the boat and continue playing until everyone has had a chance to be a disciple and everyone has had a chance to be the storm. 1. On one side of the blue paper, have the children draw a picture of a boat on calm water. They can include people in the boat, such as Jesus and his disciples. Use start stickers in the sky to make a night scene. 2. Turn the paper over. 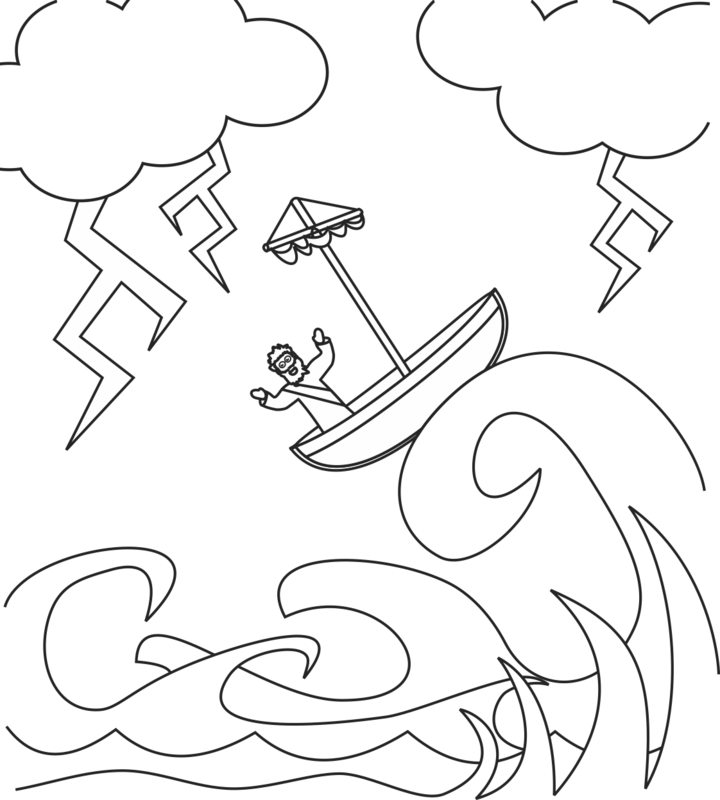 On this side of the paper, have the children create a picture of a boat in a storm. They can use the yarn to create waves, the cotton balls to create clouds, and the tin foil for lightning. It says to print but its not letting me. Interested in your pictures for my class at church. Unless stated, artwork is the property of Nathaniel Detweiler. Not intended for commercial use. Simple theme. Powered by Blogger.